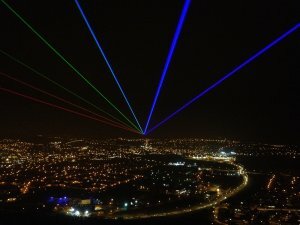 An exhibition featuring the best amateur photographs of the spectacular laser display ‘Global Rainbow’ has opened in Ards. The large scale outdoor laser projection created by American artist, Yvette Mattern, was visible from Scrabo Tower for miles from dusk until midnight over four nights in March and now the best entries in a photographic competition to capture the lasers have been brought together for an exhibition in Ards Arts Centre. The winning entry, by Alan Montgomery from Belfast, was chosen from 75 submissions and will take pride of place among the work of 12 runners-up and a selection of photographs which the judges – Danny McCaughan, President of the Northern Ireland Photographic Association, photographer Donal McCann and Emily Walsh, Arts Officer with Ards Borough Council – felt were particularly interesting images. ‘Global Rainbow’ was brought to Northern Ireland by Ards Borough Council and Arts Council of Northern Ireland, in conjunction with the arts production agency, Amino, and at that time signalled 100 days to go to the opening of the London 2012 Festival in Northern Ireland which is set to begin on 21 June. The exhibition of Global Rainbow photographs is on show in the Sunburst Gallery, Ards Arts Centre, Conway Square, Newtownards until Friday 29 June 2012. Admission is free. For further information contact the Arts Centre, Tel: 028 9181 0803. For further information contact Ursula Mezza, Ards Borough Council, Tel: 028 9182 4021.